A place to share all my Stampin' Up! Creations with you. As you can see in the picture below, I attached my twine to the card using staples. The added bonus is that I created a pocket to slip the stamped doily image into. Thanks for stopping by today. Be sure to check out all the other wonderful projects on the PS blog today. When is a Flower not a Flower? Today over at the Practical Scrappers Blog, we are giving you 9 ideas that will answer that question. My answer? This card is destined for someone I've never met in person but who I've become online friends with through my ScrapHappy group. 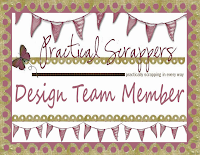 (If you are interested in joining Scraphappy just click on the link.) We were challenged by Stacey Julian at Big Picture Classes to send out "Happy Mail" so this is what I am doing. What is Happy Mail, you ask? Real letters and cards that you send for no reason other than that you were thinking of that person and wanted to let them know in a non-electronic way! WAY better than the usual bills and junk mail fliers you find in your mailbox, right? Anyway, I'm off topic. Here is a quick tutorial showing how I made this butterfly out of my flower punch. Step One: Stamp this image from Mixed Bunch. I used Midnight Muse ink on Summer Starfruit card stock. Step Two: Punch it out using the coordinating Blossom Punch. You are left with a flower that looks like this. Can you see the butterfly hiding inside it? Step Three: Cut out the butterfly as shown. Easy right? Now you just need to attach it to your card or layout and embellish as desired. Thanks for stopping by today. If you haven't yet seen all the other ideas of what to do with your flower punch, I encourage you to pop over to the Practical Scrappers Blog and check them out. Here are your links for Stampin' Up! products used on this card. Two years ago when my eldest daughter, Marley, was about to start Grade One I surprised her with a fun cone of goodies hanging on her door in the morning. I'd heard about the idea from Big Picture Classes Big Idea Festival (actually a combination of two different ideas) and ran with it. I almost forgot to do one for Paige this year but managed to squeak out this little beauty after she'd gone to bed. Sorry about the quality of the pictures but it was pretty late!! The two ideas I combined were 1) to make a paper cone and fill it with summer goodies and 2) in Germany it is tradition to give a gift to your child on the first day of Grade One. Marley actually reminded me several times to do this for Paige! Paige got to pick the paper but had no idea what it was for. She chose a paper from Floral District and I picked out some coordinating papers to make the butterflies. I made them using my Beautiful Butterflies Die for the Big Shot. Here's a close up so you can see the layers and the added rhinestones. I kept the wings popped up by using Snail adhesive in the centre of the butterfly and Stampin' Dimensionals under the wings. This butterfly was found at Michaels - it's a little clip. So ridiculously delicate (it broke pretty much immediately!) but so beautiful too! I filled the cone with school-ish related supplies - a Hello Kitty mini white board, a journal with some matching pencils and another smaller journal with attached pen. All things I knew Paige would love to have and use. She is my little artist and as such is always looking for paper to draw and write on! Another view looking deep into the cone. Thanks for stopping by. It's been a crazy week and a half since school started. I am WAY behind in my crafting, my blogging and just about everything! Hopefully this is the first post of many as I catch up. Have a wonderful rest of your day!! See you soon. Nope, you didn't read that wrong. It's the latest promotion from Stampin' Up! 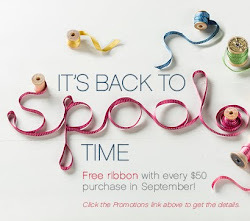 For every $50 purchase you get a free spool of 3/8" Stitched Satin ribbon. Please click on the picture below for all the details. Patio Party DSP is fast becoming my favourite set to use to make birthday cards. My daughters were recently invited to the 5th Birthday Party for my upline Sandra's daughter so I got out the Patio Party and got busy. My middle daughter, Paige, got to give input into the design as she is closest in age to Sandra's daughter. She wanted the bunting pattern paper, a stamped cupcake and the butterfly. She even picked out the Pool Party card stock base. I think she may have a future in this business!! They had a great time at the birthday party although the Birthday Girl was definitely more interested in the presents than the cards! C'est la vie!! 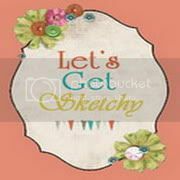 I made the design team at Let's Get Sketchy! Woot woot!! That's it. That's all I wanted to say. Look for my first layout on the LGS blog on Monday September 3rd. Thanks everyone! Have a great Wednesday!! Inspired by the easy creativity of my Upline Sandra I tried my hand and making a box to contain a set of Thank You notes I had made for a friend. It was surprisingly easy! You know that adage "measure twice, cut once"? REALLY important as it turns out!! LOL! The first box I made was too narrow but ... c'est la vie! Next one was perfect. It worked out better than I'd anticipated. This paper is thicker than most of our card stock and is easily sturdy enough for box making. To keep the cards from falling out of the box I simply wrapped a strip of Very Vanilla card stock around it and embellished it as you see. The notes themselves are super simple but that's really all you need, right? Here are close ups of them all. Thanks for stopping by. I'm thinking this might make a good class - what do you think? 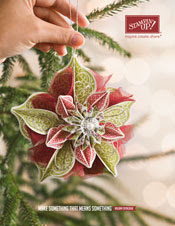 Speaking of classes have you seen my new Christmas class yet? Click on the picture below to be taken to my Eventbrite site for all the details. Stampin' Up! 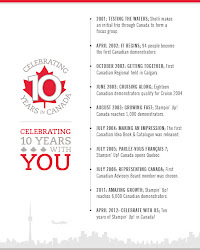 is celebrating being in Canada 10 years this year!